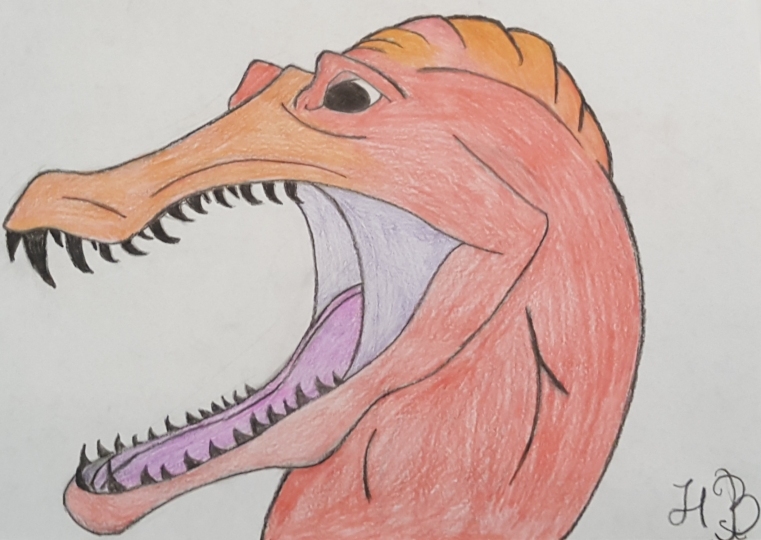 A spinosaurus drawn by Hayley, a Texas student who has used my courses. I love going to homeschool conventions. 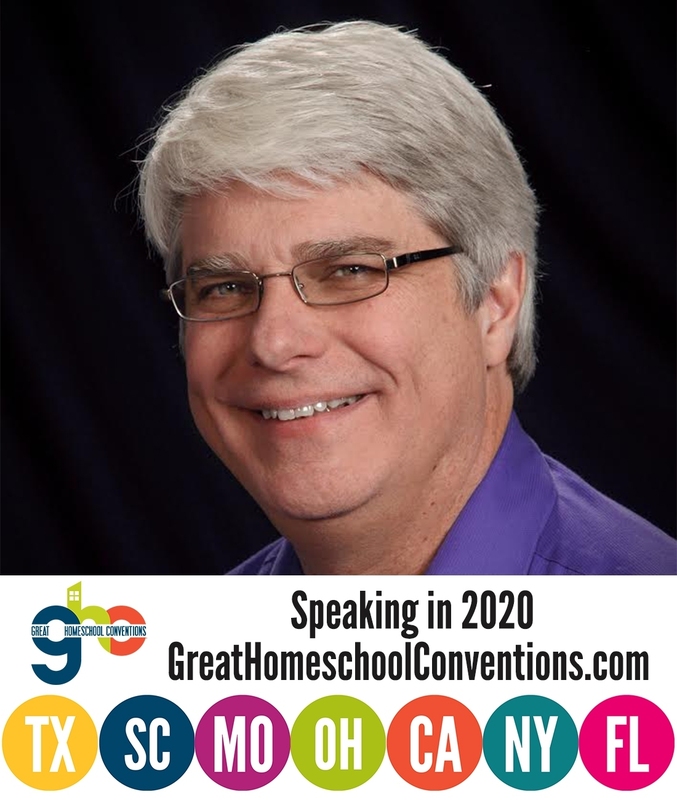 This past weekend, I spoke at the Texas Homeschool Convention, and it was a wonderful experience. I got to talk with a lot of interesting people, like the great granddaughter of Maria von Trapp. I also got a headache from discussing quantum physics, mechanistic naturalism, and determinism with two of the philosophers I mentioned in a previous post. Of course, I also got to talk with students who have used and are using my courses. One of those students was incredibly enthusiastic, asking me several questions about science. During the course of the convention, she drew me the wonderful picture you see above, which is of a spinosaurus. He is the villain in a story she is writing. Speaking of dinosaurs, I got a very interesting question during one of my talks. A student who was obviously interested in science asked if I had heard about the pregnant Tyrannosaurus rex that had recently been found. I was surprised by the question for two reasons. First, I had not heard about it, and I try to keep up on the latest events in science. The fact that this student knew a current event in science that I had not heard about really surprised me. Second, it seemed strange that someone would say a Tyrannosaurus rex was pregnant, since all that we know indicates it was a reptile, meaning it laid eggs. I think the term “pregnant” refers to carrying a developing fetus, so it wouldn’t be applied to an egg-laying animal. Due to the wonders of in-flight internet, I was able to investigate the student’s question on my flight home. Sure enough, there were a lot of news stories about a pregnant Tyrannosaurus rex (see this one, for example). However, when I found and read the scientific paper upon which the stories were based, it became clear to me that the news outlets were doing their typically less-than-stellar job of reporting on science. Because medullary bone is unique to female birds, its discovery in extinct dinosaurs solidifies the link between dinosaurs and birds, suggests similar reproductive strategies, and provides an objective means of gender differentiation in dinosaurs. Second, if her interpretation of the bone type is correct, the Tyrannosaurus rex wasn’t really pregnant – at least not in the way the term is colloquially used. It was just in the process of making or laying eggs and could therefore be definitively identified as a female. That paper was published in 2005, so why all the fuss now? Well, since chemicals produced by dinosaurs have been routinely found in many dinosaur fossils, she and her colleagues decided to chemically analyze what they interpreted as medullary bone in the Tyrannosaurus rex fossil. In birds, medullary bone contains a specific chemical, keratan sulfate, which does not appear in any other type of bone. The presence of that chemical in the fossil would confirm that the bone is medullary bone, which would add more weight to the interpretation she proposed in 2005. They ended up finding strong evidence that the keratan sulfate is present in the fossil. Specifically, they used different chemicals that tend to bind strongly to bones that contain keratan sulfate. They showed that those chemicals bound as strongly to the fossil as they do to medullary bones in birds. As a result, it seems pretty clear that the bone she originally interpreted as medullary in the Tyrannosaurus rex fossil is, indeed, medullary bone. Thus, its presence in any dinosaur bone is probably a great indication that the bone comes from a female dinosaur that is just about ready to lay eggs or just finished laying them. Does this “solidify the link between dinosaurs and birds,” as Schweitzer suggests? Not really. Most likely, it means that dinosaur eggshells contained a lot more calcium than the eggshells of today’s reptiles. Medullary bone serves as a calcium reservoir for producing the hard eggshell found in today’s birds. If dinosaur eggs also had hard, calcium-rich eggshells, the dinosaurs that laid them would need medullary bone during the egg-laying process. Could you further explain the connection between the medullary bone, keratan sulfate, and the relative calcium levels present in eggs? I.e. Why does the amount of keratan sulfate present in the medullary bone have a direct influence on the levels of calcium of the eggs for reptiles and birds? Is keratan sulfate present in varying quantities from species to species in modern day reptiles? Could you also expand upon the role of the medullary bone in formation and laying of eggs? Medullary bone is made in order to store calcium until it is needed to make the eggshells. When the eggshells need to be made, the medullary bone is destroyed so that the stored calcium can be used. It is thought that keratan sulfate regulates the formation of medullary bone, but I don’t know if any specific mechanism has been established for the process. So keratan sulfate doesn’t directly affect the calcium in eggs. However, it does so indirectly, by regulating the calcium reservoir that is established in the medullary bone. Keratan sulfate exists in all vertebrates, but not in the bones (except for medullary bone). It is found in the cornea of the eye, the central nervous system, and in the cartilage of joints. In those structures, it obviously performs different tasks. I am not sure what it does in the cornea of the eye, but it helps to heal certain nerve tissue injuries in the central nervous system, and in the joints, it serves as a cushion to absorb shocks. I met you in your booth at the Texas conference this past week. I purchased the first of your new elementary science series. My boys and I are loving it! We’ve already done the first four lessons. Following science through history makes so much sense. And, the lessons are not a pain to do. I’m finding that it’s what we are looking forward to every day! Thank you! I am so glad it is working well for you! I posted but it didn’t seem to work. So once again. The bible says there are kinds. No divisions of creatures. There are bird division and kinds within it as the ark story of the crow and dove showed. Yet birds are clearly birds despite minor differences. Dinos are no more in a group then mammals are. Dinos are not reptiles. There are no reptiles. These are classification concepts based on trivial traits that very different looking creatures share. Dinos, probably some, laying eggs no more makes them reptiles then birds laying eggs makes them reptiles. Or the platypus. Snakes lay eggs and some birth live. yet they are still of the snake kind. Turtles, snakes, skinks, crocs are no more related to eacxh other then to anything. Having some minor like traits doesn’t make a division in biology. Biology doesn’t recognize these man made fables of classification I say. Dinos are not reptiles. in fact some dinos may of morphed into post flood “mammals” i an thinking of the reptile/mammal type of dinos in the literature on fossils. YEC should first see kinds. Then have a skepticism about other divisions made up by man. To advance better investigation and stop dumb comparisons like they make in saying birds are related to dinos. Sure, Robert, the Bible says there are kinds. However, that doesn’t mean there aren’t other ways to classify animals. Indeed, the classification system you seem to deplore was actually produced by creationists like Carl Linnaeus. The fact is that reptiles do form a group. They are united by several common features, none of which are trivial. Since dinosaurs share those features (as far as we can tell from fossils), they were probably reptiles as well. Snakes are a perfect example of why reptiles group with one another and not with mammals. While some snakes give birth to live young, they do so by simply keeping their fertilized eggs inside of them. This means they are ovoviviparous. Contrast that to mammals, who also give live birth to their young but are viviparous. The mammals don’t carry fertilized eggs inside them. Instead, there is a placental connection between the mother and the developing young. Rather than getting their nourishment from a pre-formed structure (a yolk) that is totally separated from the mother (as is the case in reptiles who birth live young), the developing embryo gets its nourishment from its mother through the placenta, which is a part of the mother. This very important difference in the way the embryos develop draws a clear line of distinction between mammals and reptiles: placental development (along with warm blood and a few other characteristics) means mammal, egg development (along with cold blood and a few other characteristics) means reptile. There is simply no way reptiles can “morph” into mammals. That would mean reworking fundamental aspects of their biology, including developing a means of regulating body temperature, turning scales into hair, developing a placenta, developing mammary glands in the females, etc., etc. That is far, far, far beyond the scope of microevolution. Did God classify creatures by these reptile divisions? Does biology? why not classify due to eyeballs? A great group. A trait. You agrere reptiles are grouped because of traits. So turtles, crocs , snakes are in this division and it means something. I say these creatures are only kinds and its only a few traits that are alike. They are so different that only the word KIND classify’s them. Reptiles is picking a few traits only. Missing the majority of difference. i know about the snakes. yet they do birth live or in egg. Thats a trait that separates them. let its trivial. likewise any egg laying is trivial. Some “mammals’ lay eggs but its not making them reptiles or birds. its trivial. its not justified to classify creatures this way. Old carl was simply wrong and simplistic. Havinf mammary glands and hair in no way relates as a real group rhinos and mice. they are kinds with minor like traits I say. Its so minor that the mamma; concept has no meaning. Further evolutionists use it to teach common descent. In fact its minor common traits from a common blueprint. Dinos being reptiles is founded on the same traits as being birds? are you agreeing dinos are birds as evos say? I doubt it. I don’t agree there is a dino group either. i say its time for a new creationist classification based on actual biological relationships and traits. Scales is not a worthy trait anymore then nostrils. I do think some “dinos’ might of changed into ‘mammals” by minor tweeking of a few traits. I’m thinking of a group in the fossil record of a dino that looked like a wolf. anyways i say there is no bio evidence to say dinos were reptiles anymore then they were birds. Its just a good idea to lay eggs. Platypus or snake or bird. Iyet lets not lump them into a real bio group. it would help creationism to see KINDS as the only groups save in a case like birds. if one adds up traits and its a great sum of difference then there is no reason to group those creatures. A turtle is so different from a snake by summing that to claim both are reptiles is a error of grouping traits. just bringing the subject up for your reflection. Absolutely it does. That’s the whole point. There are natural groupings of organisms by non-trivial traits, and that’s the whole point of biology’s classification system. We classify organisms because biology makes that classification so clear. Yes, turtles, crocs, and snakes are all reptiles, because they all share the non-trivial traits that make them reptiles. There are certainly differences among them as well, which is why we have more classification groups. Because they share reptilian traits, turtles, crocs, and snakes belong to class Reptilia. Because of their shells, turtles belong to class Reptilia and order Testudines, while because of other traits crocs belong to class Reptilia and order Crocodilia. Because of other traits snakes belong to class Reptilia and order Squamata. Yes, some snakes give live birth and some don’t. However, as I pointed out previously, they all form amniotic eggs. Some lay them, some keep them inside. However, they all form amniotic eggs, and that’s one of the traits that unifies them, along with being cold-blooded, having scales, etc. Carl Linnaeus, like many creationists, saw the order God instilled in nature and classified it accordingly. To deny that obvious order is wrong and simplistic. Of course having mammary glands and hair makes real groups. It also clearly separates mammals from the reptiles. You mistakenly think that some reptiles “morphed” into mammals, but a basic understanding of what groups reptiles together and what groups mammals together clearly shows that’s not possible. Scales cannot become hair. Amniotic eggs cannot become placentas. Cold-blooded creatures cannot turn warm-blooded. Mammary glands can’t form where they weren’t before. You are proposing evolutionary transitions that simply are not possible. Dinos are not birds. They are reptiles, and their traits clearly show that. There are non-trivial traits (like being warm-blooded, trabecular bones, unidirectional respiratory system, etc.) that separate birds from reptiles. Dinos don’t have those traits, but based on their fossils, they did have the traits that define the reptile class. Thus, they are reptiles, not birds. Of course there is lots of evidence to show that dinos were reptiles. They had scales, laid eggs, were most likely cold-blooded, etc., etc. These are traits that define reptiles, so dinosaurs were probably reptiles. You say you want a “new creationist classification based on actual biological relationships and traits,” but you are discounting the creationist-made classification system that is based on actual traits! Your example of platypus, snake, or bird is another excellent one to show how wrong you are! Each of these creatures has a suite of traits that group them into different groups. Snakes have scales, make amniotic eggs, are cold-blooded, etc. That makes them reptiles. A bird has feathers, is warm-blooded, has trabecular bones, and makes amniotic eggs. That makes it a bird. The platypus has hair, nourishes its young with milk, and is warm-blooded. That makes it a mammal. The fact that it lays eggs separates it from the rest of the mammals, which is why it is in class Mammalia but order Monotremata. You couldn’t be more wrong about this, Robert. God created organisms with many traits, and those traits help us classify them into groups such as reptiles, mammals, birds, etc. To deny that is simply to deny the facts that are before you! Interesting discussion and so I’ll finish it with the equation. What is the sum of the traits, trivial or non trivial, that justify’s lumping creatures together. You say eggs, as one point, lumps dinos with/as reptiles. Yet i point out the platypus. It is not lumped because it lays eggs. So eggs laying should not be a lumping law if it fails with the platypus. thats a equation using natures laws. I see no connection between a turtle and a croc or snake. they have so many traits that make them different from each other that the few like traits are swamped. Scales is no more important then them having the trait of eyeballs. You are agreeing with old classification systems used by a bible denying world for centuries despite some old creationist who started lumping. Why? Its not from the bible. The bible says KINDS and clean/unclean KINDS. It might mean God had other bigger groups but why would he. Yet he would use like traits for like needs. Egg laying is no big deal. One has no evideence in biology to say it is a big deal. Mammary glands surely a good idea from a common blueprint. Yet why group rhinos, whales, us as mammals because of this? Why not eyeballs or tongues. I know I’m saying yEC should lead on this correction and it would solve many issues. The evos do insist birds and dinos are closely related because of trait grouping . They do what they do but I’m sure you don’t agree a eagle is a relative of a t rex. Yet by your laws why not? Anyways its the principal of lumping critters together by traits and what traits. I say there is no evidence God made biology to group creatures by traits and the summing of it alone disproves present classification systems. I say God made Kinds from a common blueprint and like traits is only for like needs from like blueprint laws. YEC is superior to the others and i so we can disagree as it sharpens everybody and offers both insight. It is a reptile. You say that you “see no connection between a turtle and a croc or snake,” but those characteristics connect all turtles, crocs, and snakes. This is the entire point of classification, which is a critical step in understanding the biological world. You claim that I am using “old classification systems used by a bible denying world for centuries,” but that is clearly false. In fact, it was the Bible-believing world that developed this classification system, and Bible-believing scientists routinely use it today. All the major players in YEC use this classification system. You are correct that it has been used for centuries, but that’s because it works so well. Biology clearly corresponds to a ordered classification system because it was created by God. Of course egg-laying is a big deal. Once again, it helps to separate many different groups of creatures. You can deny that all you want, but that doesn’t change the facts involved. No other group of creatures shares these specific characteristics, so clearly, mammals should be grouped together. You say you want YECs to lead when it comes to biology, yet as a YEC, you are denying basic facts related to biology. You can’t lead in science when you deny basic facts. Even if some dinosaurs had feathers, they didn’t have the other characteristics of birds, so they are not birds. Once again, this is why classification is important. If you understand the differences between reptiles and birds, you understand that they can’t be related, since there is no way evolution could transform the characteristics of reptiles into the characteristics of birds. As I told you before, this would also keep you from your mistaken notion that reptiles “morphed” into mammals. There is no way evolution can transform the characteristics of reptiles into those of mammals. You can say a lot of things, Robert, but most of what you say is contradicted by observable facts. If you really want to lead in biology, you have to stop denying observable facts. As I said it was a interesting discussion but we made our points. I don’t deny basic facts. I interpretate that differently. Evos say this to YEC all the time by the way. I respond to them as i do to you. There are basic facts. Traits but not enough to justify grouping as I see it. I understand your trait list but its very little relative to the glory of any creature kind. O don’t agree egg laying is a worthy trait in any list. It crosses all types of creatures. Very trivial detail. as i score it. You are list traits but all creatures being listed with eyeballs just WOULD make it silly. Rather there is a very common blueprint and like traits is only for like needs in unlike kinds. I wish YEC would lead on a correction and be ahead of the curve. Anyways another good subject on your blog. Not only do you deny basic facts, Robert, you are now denying that you deny those facts. Once again, that’s not the way to lead in the study of biology! I agree that the list of traits that delineate a group of animals (like reptiles) is small relative to the list of traits that each animal has. That’s why biology speaks so strongly to classification! Just a few basic traits can unify a diverse group of organisms. To ignore that is to simply deny the facts. It doesn’t matter whether you agree or not, Robert, laying eggs is a very important trait that helps to make strong delineations between different groups of animals. As I already said, there is no need to use eyes as a classification tool, since all vertebrates (all animals with a vertebral column) have the same eye design. Once again, this shows how clearly biology classifies organisms. One trait (a vertebral column) predicts another trait (eye structure). To deny this is to deny a basic fact of biology. I also wish YECs would be ahead of the curve, but as long as some of them deny the basic facts of biology, that will never happen. Please take some time to learn biology before trying to “correct” it! Thank you so much for your very kind words, Heidi!